Hello paneer lovers! Today is our day of teaching and learning to make homemade paneer (cottage cheese) in 15 minutes. 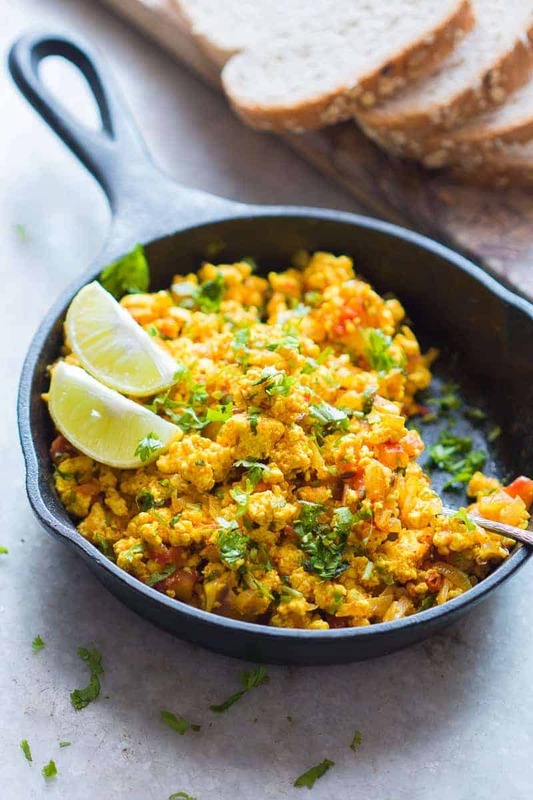 Considering how I eat paneer almost every second day of my life, this was a huge missing piece on the blog. And today we are correcting it by showing you this easy peasy way of making homemade paneer in just 15 minutes. Yes, it’s that easy and that simple and that fast, and you’ll never go back to buying paneer again. I’m so so excited to bring this post to you today. Because you know my cooking is generally andaaz, but when you are testing a recipe and end up with almost a kg of paneer after a day of recipe testing it’s not entirely bad. We make homemade paneer in multiple ways and generally it’s all free style, depending on what I have at hand. All you need are two ingredients – full fat milk (yes, do not skip this and use skim milk) and an acidic agent like lemon juice, vinegar or yogurt. 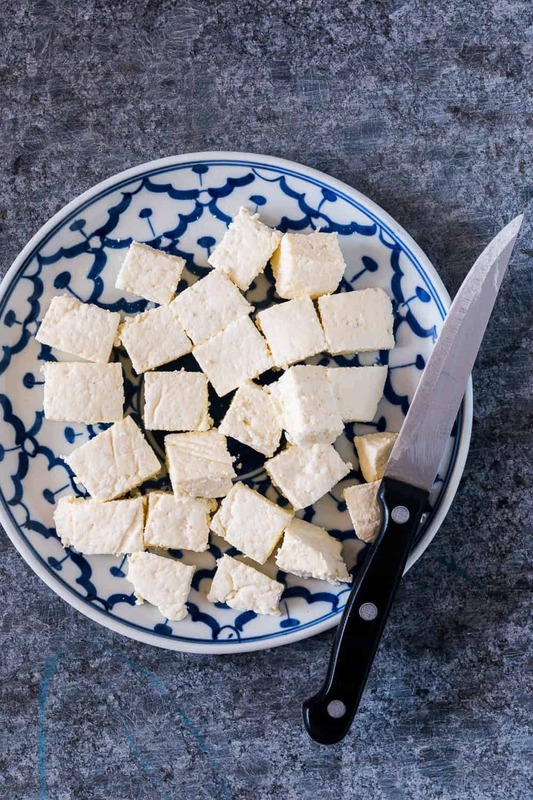 Usually I’d just tip a spoonful or a capful or maybe two spoonfuls and see what happens because it is so natural and easy to make homemade paneer in an Indian kitchen that we don’t even think about it. But I realised when I planned this post that umm andaaz is not gonna work anymore. 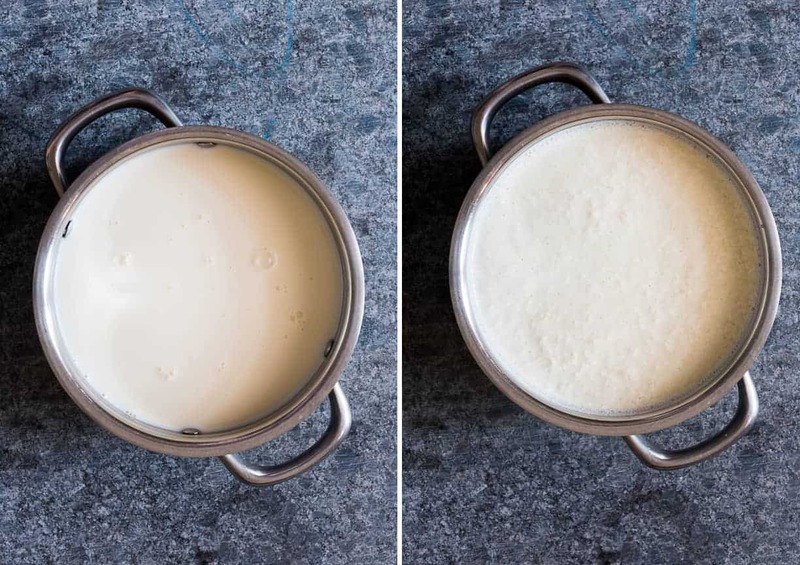 So here are easy to follow instructions to make homemade paneer so that you never go wrong, and try making our own paneer every time you crave some. Start by bringing a litre of whole milk to a roaring boil, and add a tablespoon and a half of lemon juice or vinegar to it. If using curds or yogurt, I recommend adding 1/2 cup yogurt to the milk. I prefer using yogurt because the paneer is definitely creamier and less tangy, and more fresh tasting. See how the picture on the right has cheese curds rising to the top? I added half a cup of yogurt to the milk, and took this picture midway to show you how the milk started splitting into soft cheese curds within minutes. Don’t stop there, because the process of making paneer has just started and this is about 8-10 minutes into the process. I would also recommend not going off to check facebook or scrolling through your Instagram feed because milk can boil over and spill in minutes. So stay there, because it’s just 5 more minutes to creamy, soft homemade paneer. Once the milk starts separating, simmer it for another minute or two and you’ll see it split completely between whey and cheese curds. This is how things will start looking. Switch off the flame, to make sure the paneer doesn’t overcook. Be bold and take a small bite of those hot cheese curds. It’s my favorite part of making paneer! It’s when you taste creamy, fresh, melt in your mouth paneer straight off the stove and your life will never be the same again. You are also done! The next step is to line a strainer with muslin or a cheesecloth and strain the paneer. Make sure you keep another vessel below the strainer to collect the whey. Don’t throw it away because it’s full of nutrients and perfect for kneading into dough or even spicing it with cumin and salt for a refreshing, tangy drink! Once I’m all done with straining, I like to fold the edges of the cloth over it and place a heavy object on top of it for 5-10 minutes. This really helps shape the paneer and set it into a block that you can slice into for those perfect paneer tikkas. 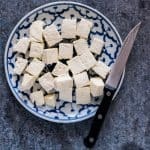 Hello soft, creamy, life changing homemade paneer! 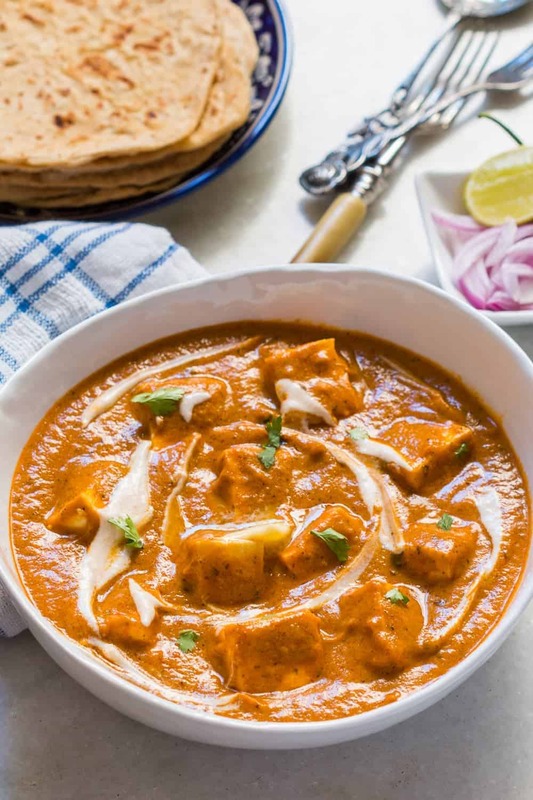 Here’s step by step instructions to make homemade Indian paneer (cottage cheese) in just 15 minutes. 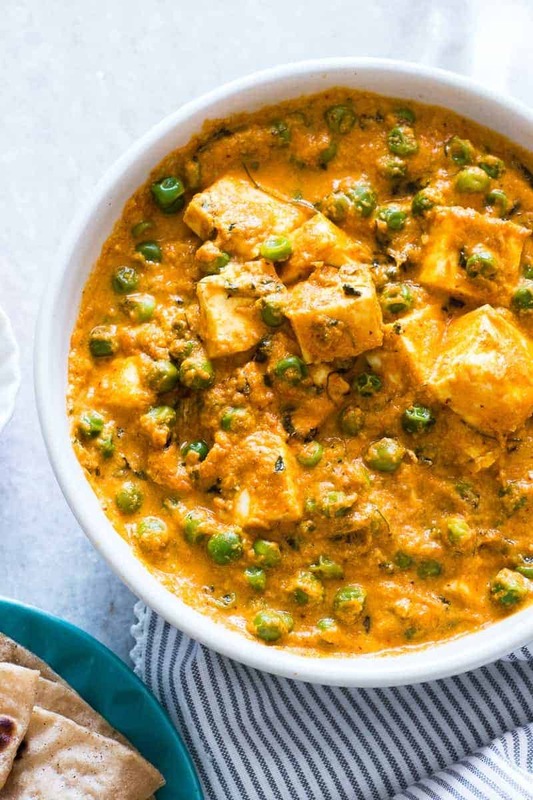 The next time you want to make saag paneer, palak paneer, makhani, tikka or matar paneer, don’t buy store bought and just make this at home with 2 ingredients. Bring milk to roaring boil and reduce the flame to a simmer. Add the souring agent of your choice (lemon juice, vinegar or yogurt) and mix with a spoon. Simmer for 2-3 minutes till you see the milk starting to split. Switch off the flame as soon as the milk splits completely and separates into whey and cheese curds. Line a sieve with a muslin cloth or cheese cloth and place this over another vessel. 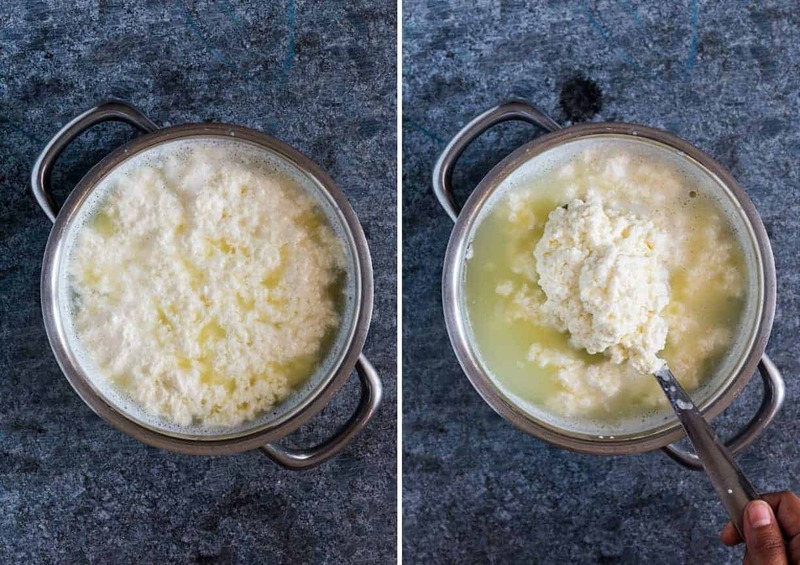 Strain the paneer into the cheesecloth and collect the whey into the bottom. Use the whey for kneading dough or to make a refreshing drink. Once the whey has strained out, you can use the paneer as is. Or if you wish to shape it into a block, cover the paneer with the edges of the cheese cloth and place a heavy weight on it. Set this aside for 10 minutes. 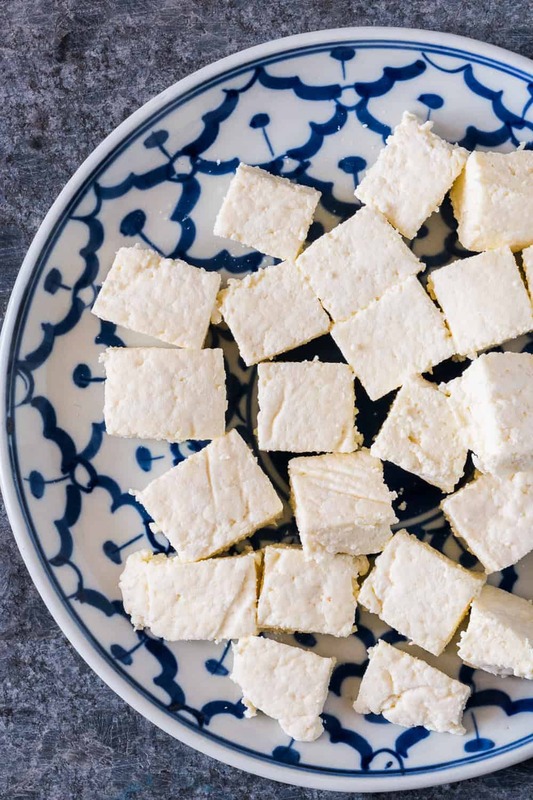 Cut and store the paneer in an airtight container in the refrigerator for up to 3 days. This sounds great! I do have a question and I apologize if it’s a dumb one… When you say yogurt, do you mean actual whole milk plain yogurt or is there a special type you recommend? Sorry, I’m new to Indian cooking. No problem – I mean actual whole milk plain yogurt. Can we use ACV instead of synthetic vinegar in the recipe? Sure you can. Lime juice works too. yesterday I made paneer but used wine and apple vinegar – NOT recommended (but I wanted to try it for a recipe with my daughter and that was apparently the only sour thing I had in my kitchen yesterday). It left me a bit frustrated so I started to read on it. I love your name Joke! And thank you for sharing your experiment – I’m sure this will help other readers too. Was it your first time making paneer at home Shahbaz! So glad you loved it. Homemade paneer is the best! Thanks Shahbaz. Homemade paneer is always the best! I haven’t made your recipe yet. I’m confused, how do you make cottage cheese from the paneers? Please explain! Hey Tisha, in India paneer and cottage cheese are the same thing. Paneer is a firm cheese like I’ve shown in the pictures. Its slightly different from the cottage cheese sold in America and Europe where the cheese is softer. Thank you so much for the recipe Richa. Just a small question (I’m new to Indian food) will this paneer stay intact when added to a curry and not melt off? Thank you so much for this recipe with easy to follow directions! I just made it today, and it turned out perfectly. The pictures really helped me confirm that I was doing it right, and that my whey was the right color. I had to restrain myself from just eating the paneer plain instead of saving it for a recipe! I am so excited to be able to make my own paneer! My next project is collecting the right spices and trying to make paneer tikka masala, my very favorite food. Thanks for showing me this link. Now I can make Paneer Curry. Yum!! CAN U ADD SALT AND IF NOT WHY? Yes, you can definitely add salt to this! The reason I haven’t added it is because you may want to salt the dish you are adding it to. I love how “just do it” your approach to making paneer is Richa! I’/m guessing that’s what andaaz means. I think I need to weight mine more heavily so it is firmer. What do you think about adding salt to the milk and acid? Any reason why you wouldn’t? Thanks Alix, so glad you liked what you saw. Paneer is actually quite easy to make at home, and I have a recipe to make homemade paneer on the site if you do a quick search 🙂 I’m sure you’ll never go back to using a substitute!